As city lover, I never thought I would ever find room in my heart for highways. But after driving cross country and learning about the history of Route 66, I will admit I have made space in my heart for the open road. This weekend is the 44th Annual National Road Festival. Just when I thought I had heard of every possibly historic festival in Western, PA, Facebook suggests an event and I’ve spent hours learning about all kinds of new history and places. Route 66 is about celebrating the car culture of America, the National Road Festival goes back even further to when we traveled west by wagons. If you are interested in exploring or looking for a little road trip, then the Nation Road Festival offers plenty of events and activities along the way. What is the National Road? Does it run through Pittsburgh? The National Road which was know by several other names during its early days, was the first federal highway. The road is 620 miles long and stretches from Vandalia, Illinois to Cumberland, Maryland. While the National Road does not go directly through Pittsburgh, all of the Pennsylvania locations are an easy day trip from Pittsburgh. The National Road travels through the counties of Somerset, Fayette and Washington. The only website I can find for the National Road is NationalRoadPA.org, I am not sure if this is just for the National Road in Pennsylvania or if the nonprofit organization happens to be located in Pennsylvania but covers all of the National Road. The Facebook Event for the 44th Annual National Road Festival includes a schedule of all of the events happening in Somerset, Fayette and Washington Counties. It is unclear to me if there are National Road Festival events taking place in other states this weekend as well. The entire schedule is available online here. Here ares some of the highlights of National Road Festival events happening this weekend, I have tried to find a website/more info for each of these locations, if you are planning to visit for a specific event, I would use the number listed in the festival schedule and call to confirm times before going. 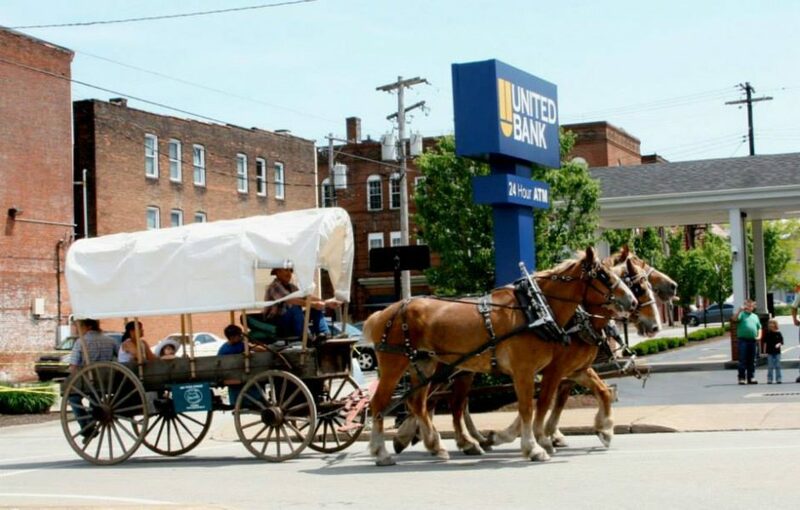 2014 – The wagon train passing down Main Street during the National Road Festival in Uniontown. Photo credit: Uniontown Concerned Citizens. If there’s a thread that holds the festival together is the two wagon trains that travel through towns and pass by area landmarks. The National Pike Wagon Train Association travels west, led by wagon master Doc Sherry and assistant wagon master Don Myers. They gathered for encampment yesterday in Grantsville, Maryland, and head out today for Addison, Somserset County. On Friday, the wagon train continues into Fayette County and the Farmington Volunteer Fire Department with a stop at A.J. McMullen School, part of the Uniontown Area School District, for lunch and to allow the children to visit. On Saturday, the wagon train heads down the Summit with a stop for lunch in Hopwood before heading through Uniontown and onto Mount St. Macrina, just west of Uniontown, where they will rest and have dinner before the wagon train breaks up and the participants head home. The Wagonier’s Wagon Train travels east across Washington County, led by wagon master J.D. Ridenour. The wagon train gathers Friday morning in Claysville, Washington County, and camps overnight at Washington Park. The wagon train arrives in Scenery Hill at 2 p.m. Saturday for super and an overnight camp. It departs Sunday, heading to the Waleski Farm for lunch around noon and then on to the National Pike Steam, Gas and Horse Association around 2 p.m. The wagon train breaks up about 4 p.m. Participants in the wagon train dress in period costume to portray pioneers who traveled west on the National Road in the early 19th century, showcasing the American spirit. Sunday at noon the Wagon Train will make a stop for lunch. Saturday, 12pm—7:00pm – 3rd Annual Wine and Arts Festival, hosted by Spirit of the River —The town of Ohiopyle and surrounding community will be hosting a Wine, Arts and Music Festival. No charge for admission— ticket sales for Spirit Tasting only – and must be 21 with valid ID. Local Crafts, local music and art. Tickets are $25, you donations is used to raise funds for support of the boro of Ohiopyle. 7:00pm – A Play at Addison United Methodist Church entitled “ Who Lived Here?” Admission is free. 11:15am-3:00pm– Antique/Classic Car Show (Main St –Luthern Church Park lot—music by JohnEB Good.